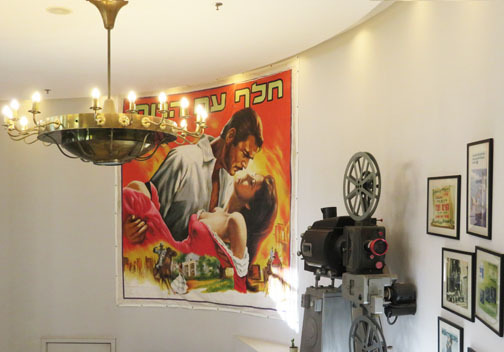 We are staying in the heart of Tel Aviv in the Cinema Hotel, a building that was built as a cinema in the 1930’s in the Bauhaus Style, as were many other buildings in the city. The Bauhaus was a school for design and architecture in Germany from 1919 – 1933. When it closed, the instructors and students relocated taking with them the philosophy of the Bauhaus – “form follows function.” Because buildings were constructed all over the world in this style, it became known as International Architecture. 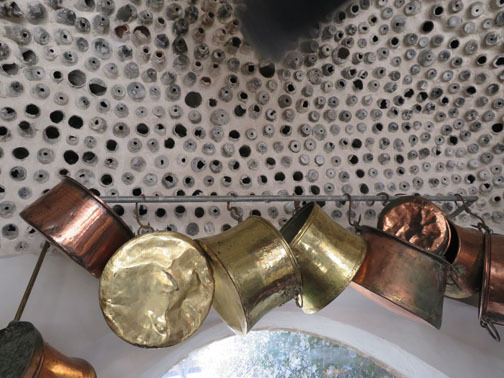 From the Bauhaus Center website: Four Israeli architects studied in the Bauhaus school: Arieh Sharon, Shmuel Mestechkin, Munio Gitai-Weinraub and Shlomo Bernstein. 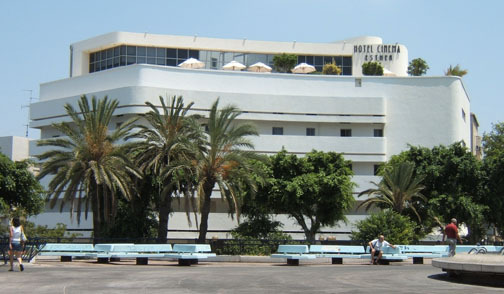 However, the influence of the Bauhaus on the architecture built in Israel in the 20’s, 30’s and 40’s was by far wider than being expressed by those architects only. The legacy of the Bauhaus was absorbed by other architects, studying in Brussels, Ghent and Italy, such as: Dov Carmi, Genia Averbuch, Ben-Ami Shulman, Ze’ev Rechter and Joseph Neufeld. And of course—all of those prominent figures presented the new ideas to just everyone who was around. 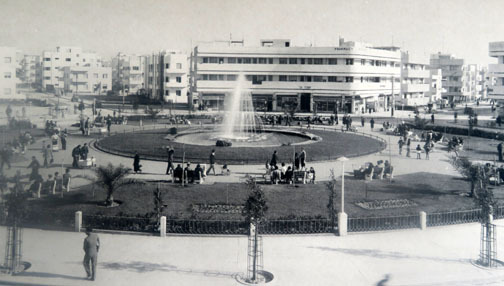 In Tel Aviv only, more than 4,000 “Bauhaus Style” buildings were built. Thousands more were built in Haifa, Jerusalem, the Kibbutzim and elsewhere in Israel. The main question is, therefore—how, in an era when this new style was still unpopular, did it reach such magnitude in the built work in Israel? The main answer is that the social-cultural ideology behind the “Bauhaus Style” fit like a glove to the socialist-Zionist movement and to the striving of this movement to create a new world. White houses, in every sense—form, style, material, functionality, color—grew from the sands without a past, towards a future. Here is a photo taken in the 1930’s when our hotel was a cinema. 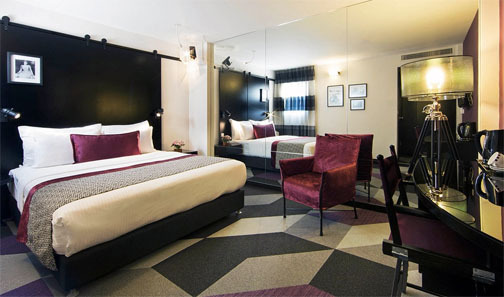 Here it is today as a hotel. 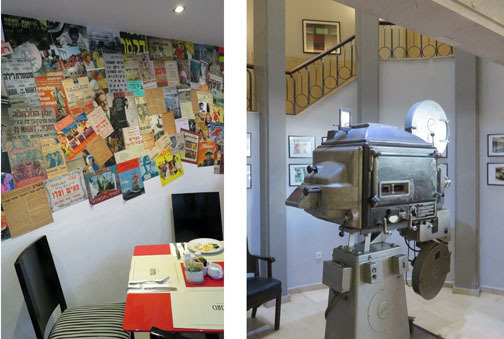 The decor throughout the hotel incorporates the cinema theme with posters, photographs, and film equipment and projectors. 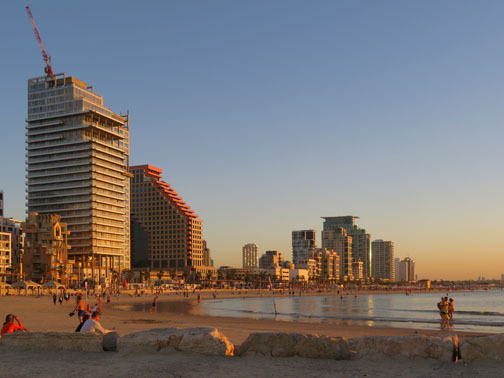 Tel Aviv is a modern, hip city with a very secular vibe. This is a sunset photo of the beautiful beach located five blocks from the hotel. 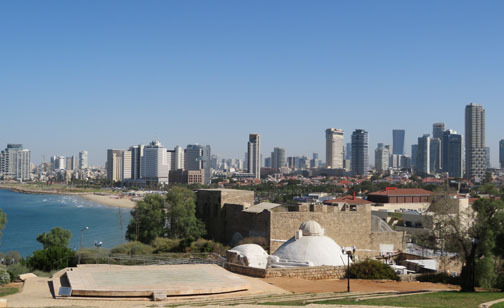 The old city of Jaffa is located at the horizon at the far right. This is a view from Jaffa looking back at Tel Aviv taken the next morning. 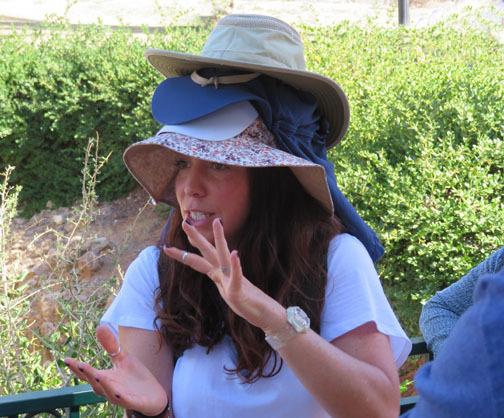 As we explored the 4,000 year-old city of Jaffa, our tour director, Revi, visually demonstrated the many layers of history with hat upon cap upon hat. 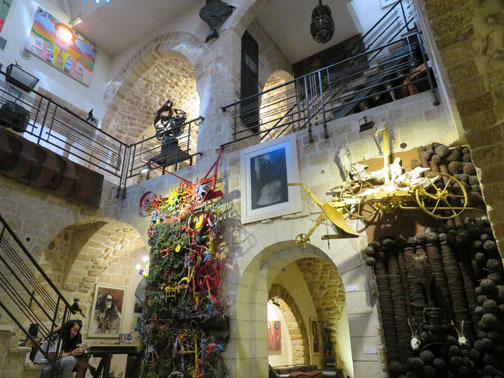 Whereas Jaffa is very old, Tel Aviv is very new. It was founded in 1909 by 60 Jewish families pictured in this photo. 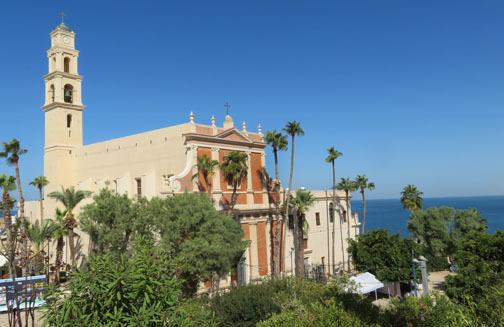 We visited the Church of St. Peter, built in the 19th century by the Spanish. The church commemorates St. Peter raising Tabitha from the dead and his vision where all sorts of creatures descended from above. 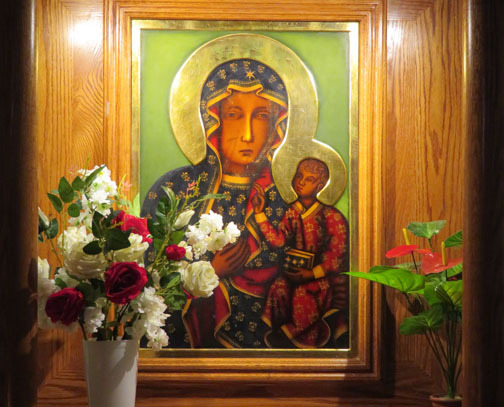 Although a Catholic church, it contains a menorah next to the altar and a Black Madonna from the Orthodox tradition. 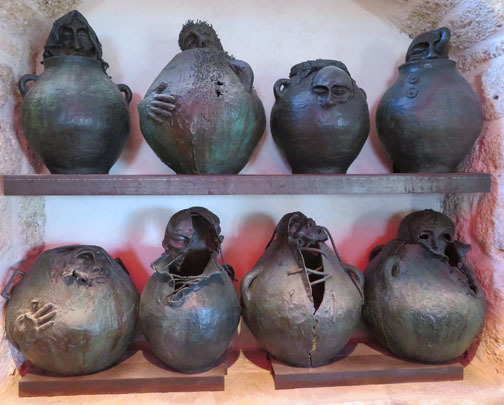 Of all of Goor’s work, I was most intrigued by these forms. On the roof top was a fountain (not by Goor) of Neptune being terrorized by playful little girls. 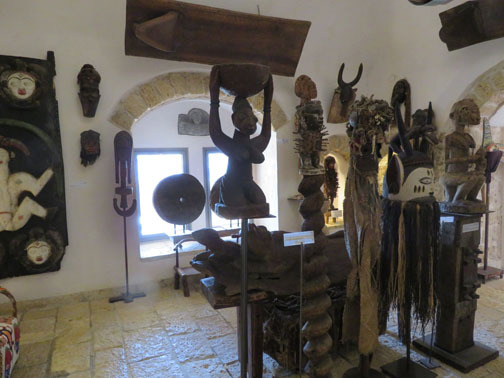 She had a collection of tribal art because she appreciated the use of materials and forms. I can relate to her love of these objects. 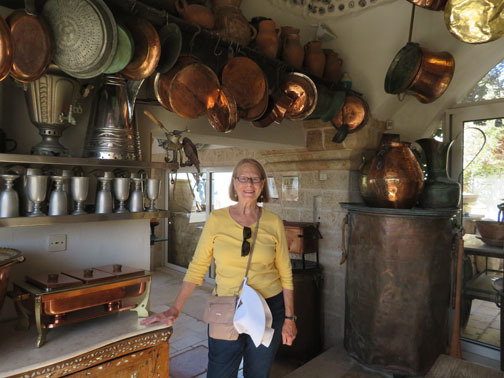 In her kitchen she displayed an impressive collection of copper, brass, and tin pots and Chinese ceramics. 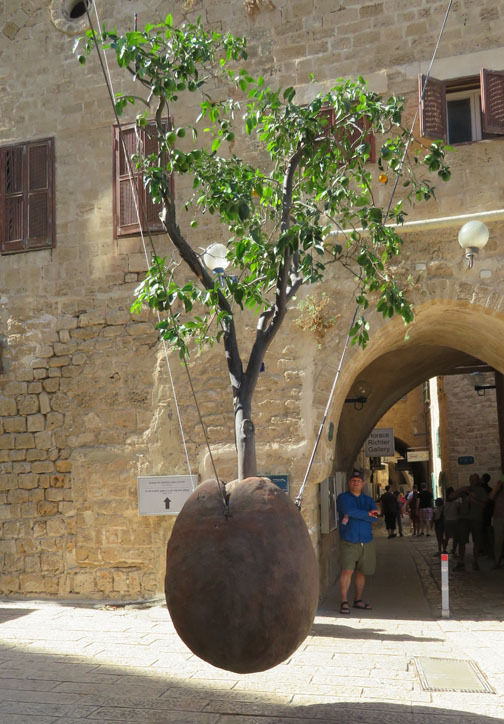 This is a sculpture by Ran Morin located in old Jaffa that references the orange trees that the first Jewish settlers in the early 20th century planted to create a source of income. Because the oranges were of high quality, they were in demand. 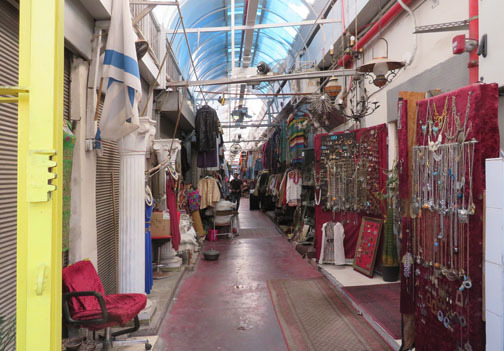 We concluded our tour of Jaffa with a visit to the popular flea market where we were encouraged to use our bargaining skills. 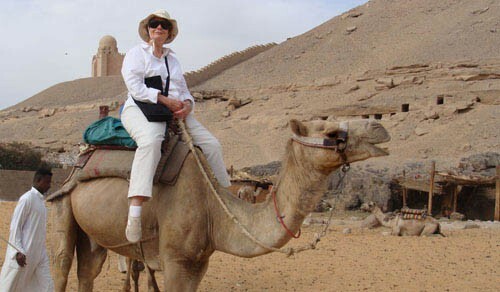 This entry was posted in Israel on October 29, 2018 by JWH.